If you can’t find Christmas bulbs to recycle, try watching the dollar type stores. Sometimes you will find a four pack of $1.00. Otherwise, look online for the 40% and 50% off coupons for the craft stores. 1.) 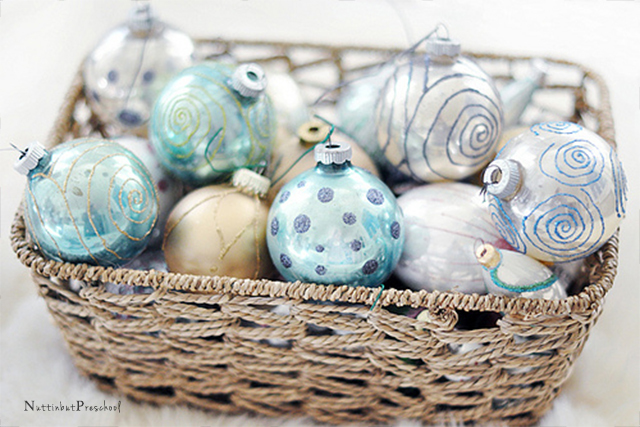 Use the glitter glue to place designs onto the matte finished Christmas bulbs. The glitter glue will not stick to the shiny surfaces or plastic. 2.) Let the designs completely dry before handling them again.